Eight Angle Pose or Astavakrasana requires a strong core, powerful arm strength and reasonable opening through the hips and hamstrings in order to practice the full expression of this pose. The following poses will help you work towards Eight Angle pose by building the strength and flexibility you need. Remember though, it’s not only about the final pose - enjoy the journey to get there as well! This pose helps to gently open the hips and build the balance required for eight angle pose. From Mountain pose step one leg back and bend into the front knee. Keep the hips square to the front and the core engaged as you lift the arms to explore into opening through the lower back and gently challenge your balance. Hold for five breaths and repeat on the opposite side. Move from high lunge into Lizard pose to further open into the the hips. Bring the hands down to the floor inside the front foot. Either stay here or to stretch a little further, roll the front foot onto the outer blade and let the knee fall out to the side. You may even like to come down onto the forearms to challenge yourself further. Chaturanga is famous for building arm and back strength as well as toning the core, which makes it the perfect prep pose for Eight Angle. From a plank position, slowly lower the body down keeping the elbows in close to the body. Remember you can always practice Chaturanga off the knees until you have the strength to work from the toes. To move into Eight Angle pose, you need a very strong core to lift the weight of the body into the hands. Boat pose helps to build that strong core you need. Take a seat and bring the hands to the floor behind you. Lift the legs off the floor and bring the calves to parallel. Keep lifting through the heart to keep the spine long. You may like to straighten the legs and release the hands towards the feet if you feel confident to do so. 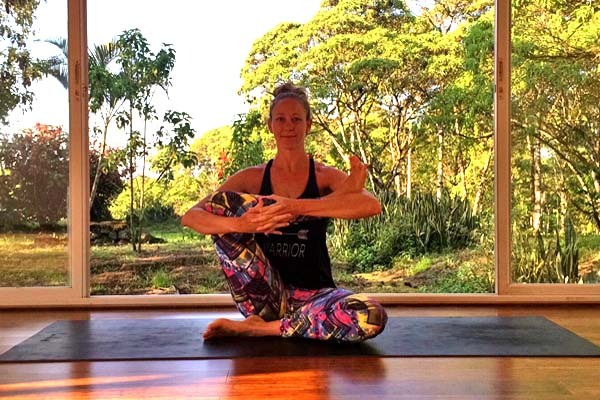 Compass pose builds immense flexibility in the hamstring and hip and is perfect for creating the opening required to lift the leg up onto the shoulder. From a seated position reach the right hand to the outer edge or the left foot and slowly begin straightening the left leg. Once the leg is straight work towards opening the right arm up above the head. Hold for three breaths then repeat on the opposite side. This pose is perfect for gently opening into the hamstrings and outer hips. From a seated position bring your right knee into the crease of your right elbow. Rest the right foot in the crease of your left elbow. Gently rock your leg from side to side as if you were rocking a baby for a few breaths then repeat on the opposite side. Ready to Move Into Eight Angle Pose? Whilst the following are not technically all ‘poses’, each can be practiced on the journey towards Eight Angle pose. These positions are how you will eventually get into the pose, but you may like to try them right from the start to help you to understand the areas of your body that you will need to work on. From a seated position with both legs out in front of you bring the right calf up onto the right shoulder. When you first start you may be able to only lift the leg up onto the tricep. Don’t give up! Keep working at opening through the hamstrings and hips and you’ll eventually get it there! Keep pressing the leg into the shoulder and bring both palms to the floor. Engage the core and press strongly into the hands to see if you can lift the bottom off the floor. Try working towards lifting the left leg off the floor as well (Elephant’s trunk pose) to build the core strength needed for eight angle pose. Bring the left foot across the body and cross it over the right. Don’t worry if your leg slips off your shoulder at first, just keep working towards pressing the leg strongly into the back of the arm. Lean your weight forwards and into the hands (just like in Chaturanga) while also shifting the legs to the side. Work towards straightening the legs by squeezing the inner thighs together. Stay here for three breaths. So that’s it! Each of these poses will bring you closer to achieving the strength and flexibility you need to practice eight angle pose. Enjoy every one of them and remember to celebrate when you eventually stick this challenge arm balance.